In five weeks, I’m headed to Israel for the first time in three years. If I could, I’d spend the entire trip exploring the rows and rows of Israeli treats at each city’s market. 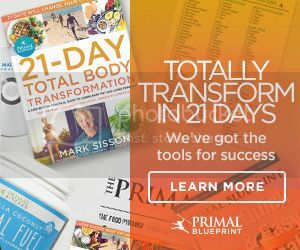 Studying abroad in the south of France was my first time experiencing the magic of grocery shopping in another country. If you’ve visited western Europe, you know that the outdoor markets there are a treasure. In Nice, it was called le marche aux fleurs; it was filled with marzipan fruits, produce from Provence, and charming antique merchants with miniature dogs and berets. Two years later, I moved to Tel Aviv, Israel. Here I became acquainted with an equally enchanting market – the souk. Lined with baskets of spices, exotic fruits, and freshly baked challot, it was reminiscent of the picture-perfect markets of France, but much louder – in true Israeli fashion. 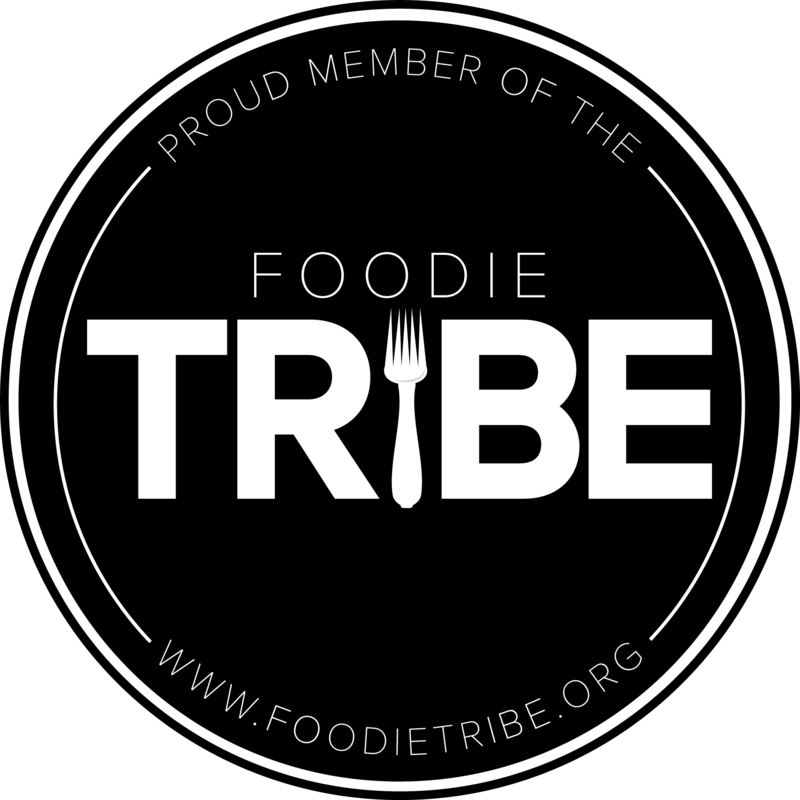 Israeli cuisine is unique because it takes these fresh ingredients and, rather than dulling them with too many sauces and heavy cheeses, serves them up with their best qualities still intact. 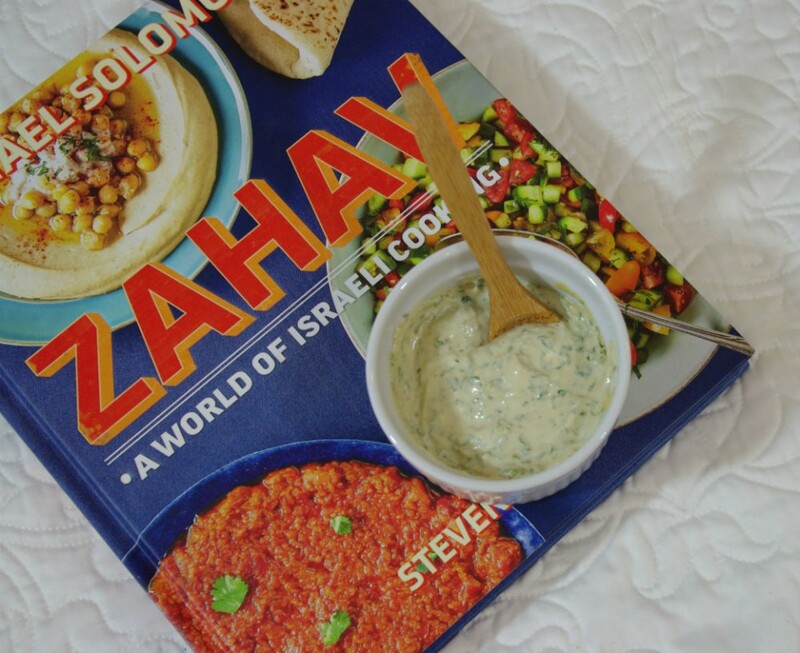 I was recently gifted Michael Solomonov’s new cookbook, Zahav, and after flipping through the pages, I knew I had to make an Israeli dish for this week’s lunches. 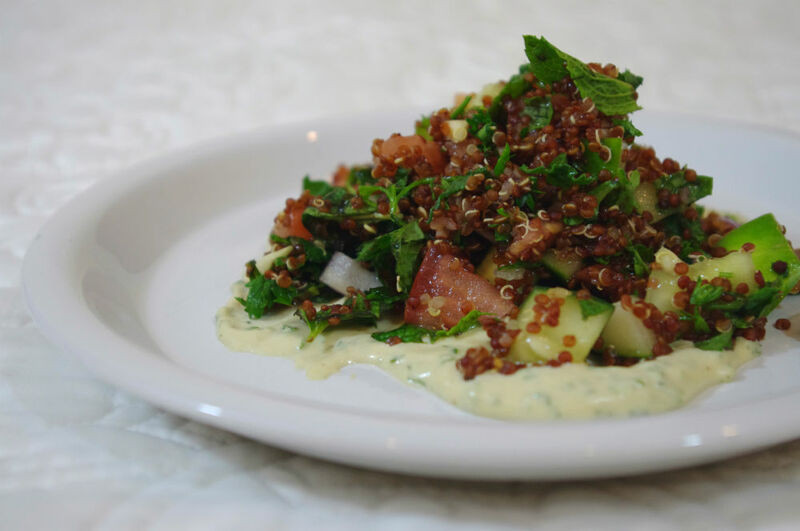 Solomonov shares recipes for a quinoa tabbouleh and a green tahina, both of which sounded incredible, and both of which show off the pure flavors of everyday ingredients. 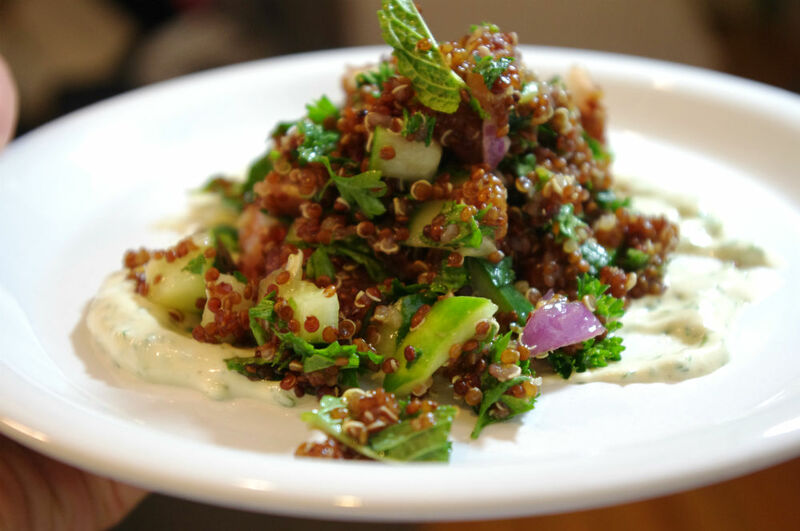 Using his recipes as a jumping off point, I made a classic Israeli salad with quinoa and elements of tabbouleh, then paired it with a simplified green tahina. The result was so incredible that I ate nearly half of the bowl, dunking my spoon in tahina each time to soak up the rich, salty spread. I suppose this is just a preview of the enthusiasm with which I’ll be eating in Israel. 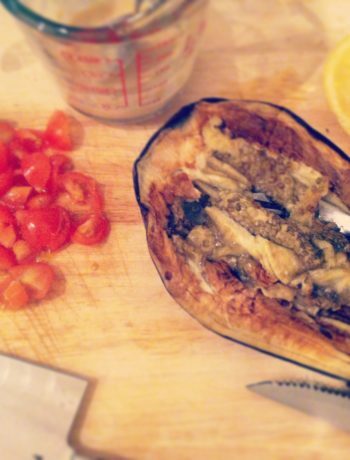 This made 3 large portions of vegan, gluten-free heaven. Start by making the tahina sauce. 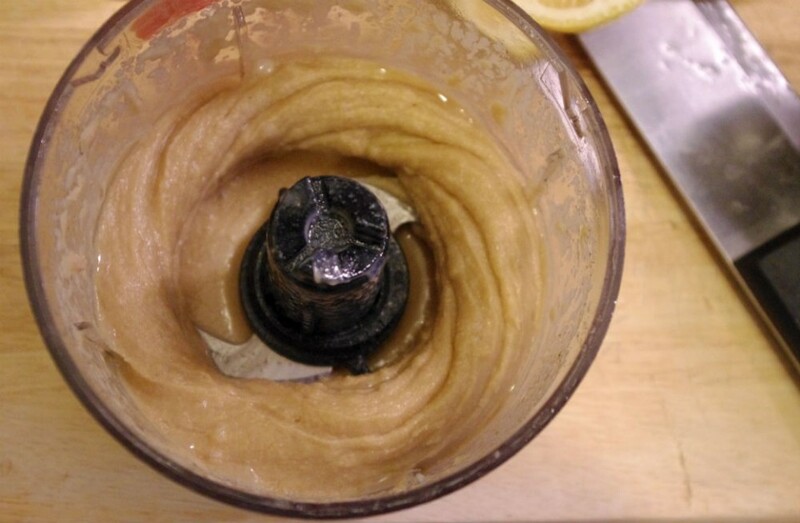 Place the tahini paste in a food processor or a bowl (if you don’t have a processor or blender, you can simply use a whisk and bowl). Add in juice from half of your lemon, about 2 tablespoons, a 1/2 teaspoon of cumin, and a teaspoon of course salt. I also like to start with a bit of cold water – so add about a tablespoon. Blend or whisk. 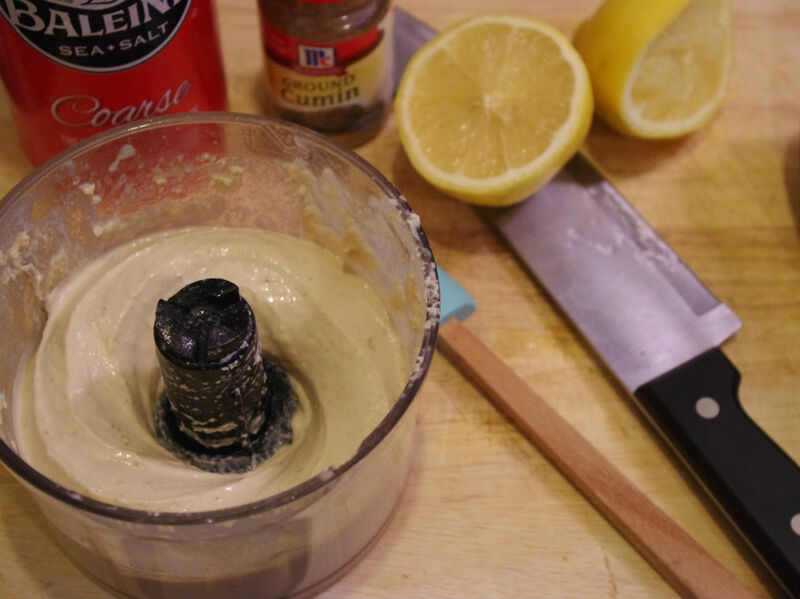 You’ll see right away that the tahini paste becomes sandy and gloppy. Add another tablespoon or two of water and continue blending. 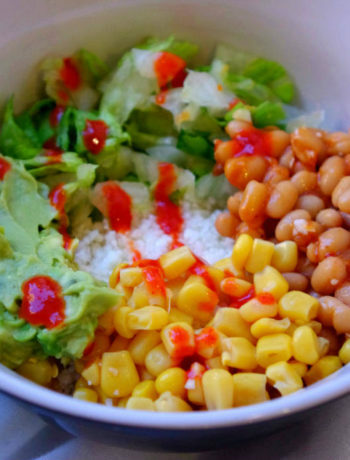 Keep doing this – pausing to check the consistency and adding a bit more water – until you reach that perfect sour cream-like state. 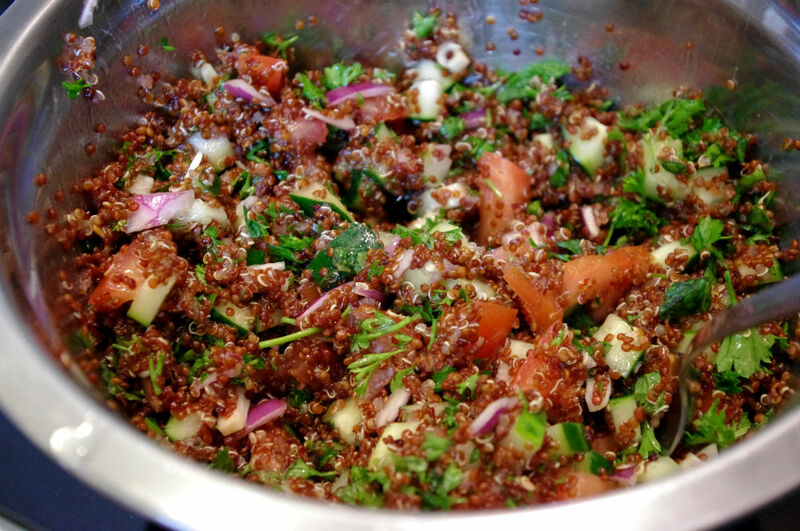 Add in 1/4 cup of chopped mint and 1/3 cup of parsley, then mix or blend thoroughly. Set aside. 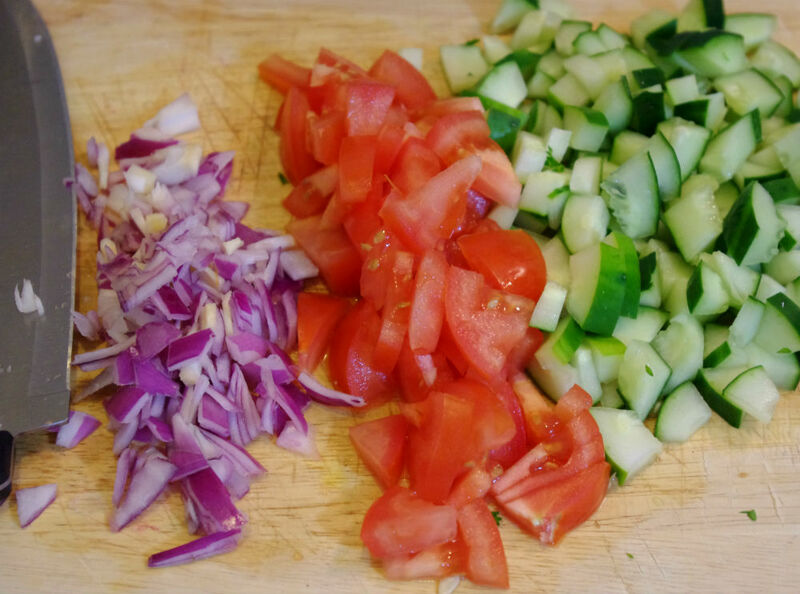 Meanwhile, as you cook your quinoa (don’t forget – for 1 cup of quinoa you’ll need 2 cups of water, and make sure one of these is vegetable broth), chop up your cucumber and tomato. Since most grocery stores sell large, English cucumbers, I like to remove the seeds. Slice lengthwise in quarters then cut off the line of seeds. Slice into tiny squares, and do the same to the tomato. 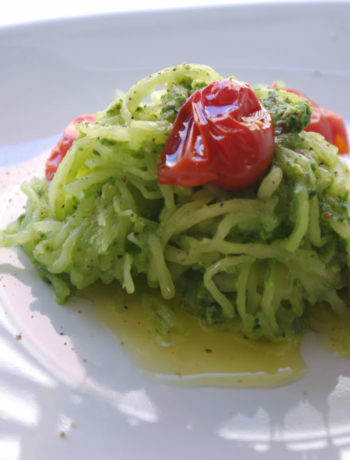 In a large bowl, combine the onion, tomato, cucumber, and remaining parsley and mint. Add the juice from the other half of the lemon as well as a tablespoon of olive oil. 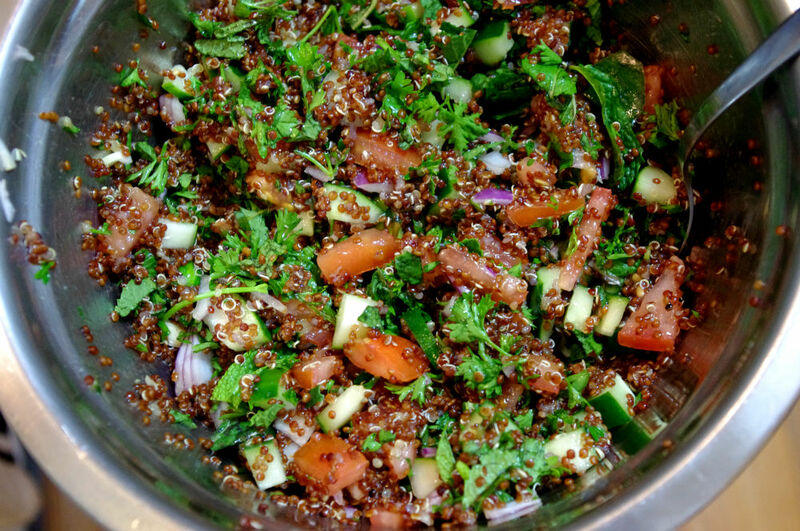 When your quinoa is finished cooking, add it into the bowl with the vegetables and stir everything together. 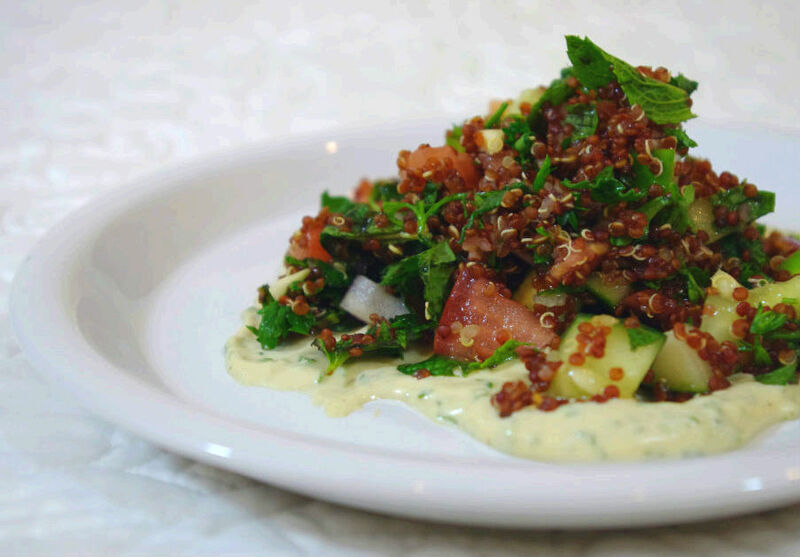 Serve the quinoa salad on a base of green tahina and enjoy!